30 years ago Peter and Hazel Hartle ran a 60 Friesian dairy herd on 126 acres directly opposite the historic remains of Corfe Castle in the heart of Dorset, along with the variable ‘help’ from their three boys of 6 months, 1 & 2 years of age. However, with the introduction of milk quotas they found it impossible to maintain the farm as a viable enterprise and had to come up with something pretty fast that they could do with their lovely milk that didn’t result in penalties for over production or tread on anyone’s toes by embarking on a venture which was already being done locally. As they had developed quite a passion for ‘ice cream crawls’, it seemed a natural progression to make their own ice cream… but so much better than anything they had ever come across on their ‘crawls’. They were adamant from the start that their ice cream should be utterly natural with no artificial additives and most certainly not coloured – who needs a ‘fairy liquid green’ in their mint ice cream! After they hit upon ice cream they beavered away finding out everything to know about what they were getting into… they were in for a few shocks along the way! 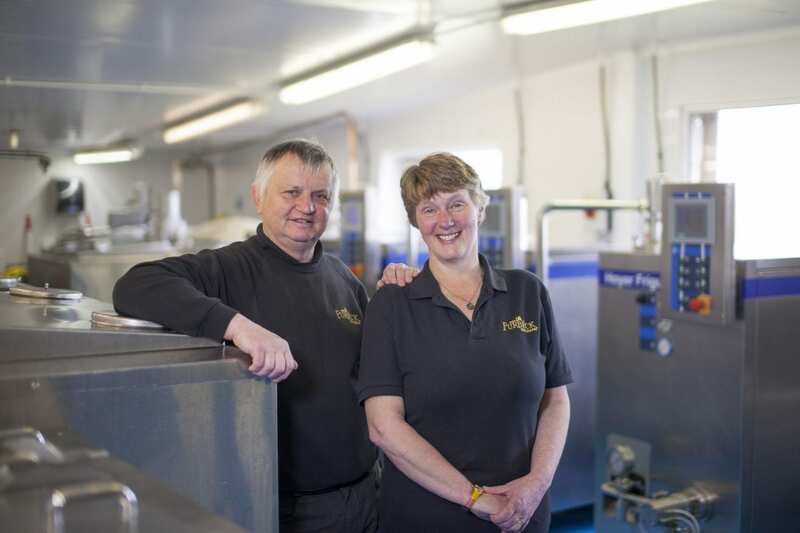 Peter & Hazel took turns in milking and skimming some of the milk for double cream to make super ice cream. They would flip a coin to decide who would drive off in the little van complete with chest freezer in the back to deliver to anyone they could find locally who showed an interest. This was the beginnings of Purbeck Ice Cream, who are now recognised as a forerunner in the manufacture and supply of farm made super-premium real dairy ice creams and spring water sorbets. 30 years later there are a few more people to help in the family business with a team of 20. Their mission statement has remained clarifying their dedication and commitment to producing only the very best, maintaining and improving their standards whilst delivering exceptional service. Peter & Hazel have no plans to sell and will continue making what they feel is the best possible ice creams and sorbets whilst delivering an exemplary service. The team growth and development is also of paramount importance, creating a happy band and recognising the importance of each team player. Regular team meetings are held to share ideas and generally celebrate life in the fast ice cream lane on team ‘bun fights’. Purbeck Ice Cream has many exceptional varieties to enjoy – all boasting clean ingredients with the best credentials of no artificial anything, no gluten, all natural flavours and egg free, suitable for vegetarians, fully accredited as suitable for Halal (except the alcoholic flavours) and, of course, no added colours or nuts of any description. With local sourcing paramount, they use Purbeck milk, Dorset cream and an abundance of natural ingredients as well as British waffle cones and they source everything they can from within Purbeck, Dorset, the South, the UK, and only going further if what we need is either not grown or of too poor a quality to consider. Purbeck Ice Cream can be found locally in The National Trust, very many prestigious Hotels & Restaurants, lots of the best independent discerning food shops, farm shops and deli’s, beach front scooping parlours and seasonal tourist attractions. There are also five events vans, along with a great seasonal team attending festivals. They also use wholesalers who distribute nationally, specializing in foods of outstanding excellence increasing distribution to include most of the UK. To find a local stockist near you, download the app http://www.purbeckicecream.co.uk/index.php/zapp-the-app/ and Enjoy!